A developer in Sumner County is instructed to make changes by the state after a neighbor filed a complaint about the runoff from its construction site. Eric Rion has lived at his house at the end of The Hollows Court in Hendersonville for 23 years. Aside from the 2010 flooding, he has not seen water flow down his property and street as bad as it has been recently. He blamed the development in Somerset Downs located right on top of the hill from his backyard for causing the muddy runoff. "We got mud and debris flowing all the way across the yard down the street everywhere. My yard stays wet and muddy every time it rains and when it dries, I got a dust bowl," Rion pointed out to NewsChannel 5. Rion said it is not uncommon for water to flow across his property when it rains hard but he said how the development is structured only exacerbated the problem. For several months, he said water from the construction site would funnel to the side where his backyard sits. "It is topping every silk fence they have. They've got a rock check dam which basically is doing nothing that's holding other stuff in place, it's a disaster right now," Rion added. Video shot by his neighbor Monday night showed muddy water flowing into his backyard. Pictures showed how it flooded the streets. He is frustrated and concerned about erosion and sediment being brought in to his property. "I don't want this to be in a year or two years when this is finished and we still have this water flowing across the yard the way it is. The second main issue is that there is no settling up here so any silt or contaminants coming off on this site is going to be settling on this yard," he said. 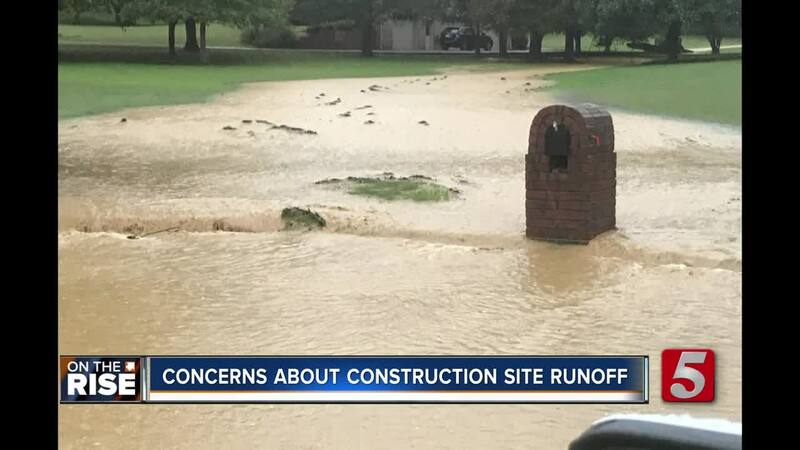 Director of Planning and Stormwater Josh Suddath told NewsChannel 5 that the drainage issue is related to the development, and that what was installed to temporarily control the water was not adequate. Last month, an inspector with the Tennessee Department of Environment and Conservation Division of Water Resources visited the site after Rion's complaint. The inspection found several violations, including no proper stormwater pollution prevention and erosion prevention plans and permits set in place. Plus, lack of inspections and the buffer not being maintained on site. A spokesperson said the state met with the developer and the county last week and have requested remediation activities be completed to address the sediment issues at the site. The state the developer is complying with all TDEC requests thus far. The spokesperson pointed out that the regulatory responsibility focuses specifically on water quality and not water quantity which is handled by local officials. Suddath said TDEC created a five-step corrective action plan for the developer to complete in 30 days.